Demand for engineering plastics in the US is expected to rise 2.6 percent per year to 5.1 billion pounds in 2019. Nylon, ABS, and polycarbonate will remain the three largest engineering plastics by volume, with nylon the fastest growing of the three. Smaller-volume engineering plastics such as polyphenylene sulfide, sulfone polymers, and fluoropolymers will grow the fastest. 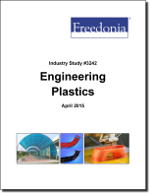 This study analyzes the 4.5 billion pound US engineering plastic industry. It presents historical demand data for 2004, 2009 and 2014, and forecasts for 2019 and 2024 by resin (e.g., Nylon, ABS, polycarbonate, thermoplastic polyesters, polyacetal, fluoropolymers, polyphenylene oxide, sulfone polymers, polyphenylene sulfide, polyimides) and market (e.g., motor vehicles, electrical and electronic, medical and consumer, construction, industrial). The study also considers market environment factors, details industry structure, evaluates company market share, and profiles 30 industry players, including Saudi Basic Industries, DuPont, and Solvay.